We wanted to share some of the great things that have been happening over the last quarter. 1. 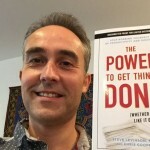 ‘The Power to Get Things Done (Whether You Feel Like It Or Not’ book sales continue to positively surprise with deals being struck to publish it in Korea and Japan. One initiative resulting from the book is a rapidly developing collaboration with a major outdoor organisation where we will be integrating ‘The Power to Get Things Done’ into their nationally recognised product portfolio. Bespoke company events will be held in venues ranging from hotels to Castles and Country Estates. If your team aren’t getting all the things you need too done then get in touch. The book seems to be a popular seller for people wanting to achieve more in 2017 or as a Christmas Gift to help their loved ones to get more done (available on Amazon). 2. Chris Cooper recently attended a ‘Leaders Quest’ visit to Kenya. Leaders Quest specialise in bringing together leaders from all over the world and from different walks of life to broaden their leadership horizons. Chris ‘s visit to Kenya included a visit to a Massai Tribe and Kibera the largest slum in Africa. 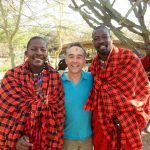 There are may special memories and some funny ones including Chris’s discomfort at having to take a toilet break in the middle of the night in a forest camp circled by hyenas and accompanied by a Masai warrior with a torch and spear. More to follow as Chris’s relationship with Leaders Quest is set to deepen in 2017 and will provide a vehicle in conjunction with Leaders Quest for our clients to also experience these exceptional experiences. 3. Engaging Leaders and Engaged Teams – The interest in employee engagement is growing as organisations seek to ensure their people are better engaged in their business to create improved commercial results. Recognised statistics state that a highly engaged employee contributes 43% more revenue than a non-engaged employee. With the likes of Brexit and US General election is that we can feel even more divided when we really need is more engagement. John Jennings our Associate Director has a wealth of knowledge and skills in this area and and we are in extended discussions around supporting organizations to make major transformation in this area. We have also been actively delivering employee engagement and leadership seminars with MBA students from a variety of worldwide countries. Our relationships are growing quickly with the University of Leicester, Nottingham Trent University and Leeds Beckett University. 4. Growth of Services Through Quality Partnership. We are very much into partnering with synergistic third parties. One such organization is Peritus Learning and Development based in Leicester. This means we can provide much larger scale programmes by integrating our resources. Where we focus on leadership, teams and getting things done, Peritus bring volume and expertise to large scale management training. 5. 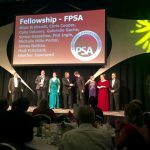 Speaking – Chris recently received his Professional Speakers Association Fellowship and has also spoke at the prestigious Space Centre in Leicester in November on The Power To Get Things Done. 6. A collaboration event with West Leicestershire CCG was described as ‘Fabulous’ by Ian Potter Deputy Chief Operating Officer. The teams found themselves enjoying a theme based around being stranded on a Desert Island – Bear Grylls style. However, they were relieved that they could still eat chocolates while having fun exploring the collaborative process. 7.The ‘Business Elevation’ radio show also celebrated its 5th Anniversary. Chris was also interviewed last week for the National Small Business Association (65,000 members) podcast hosted by Jared Nichols (The Road Ahead). This was a particular honour as the host had been inspired to set up the show in conjunction with the NSBA having been inspired by Chris and ‘The Business Elevation Show’. We will supply the links when available. Several well known organizations have also approached Chris to explore him helping them to elevate their businesses via podcast. 8. Finally Chris and eldest son Matthew made it on to BT Sport and Match of The Day on the 10th December. 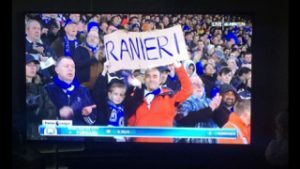 Some people had said that the Leicester City Manager Claudio Ranieri who helped us win the Premier league this year should resign. We thought better and came out in support :).